We are a production welding fabrication complex weldment shop. 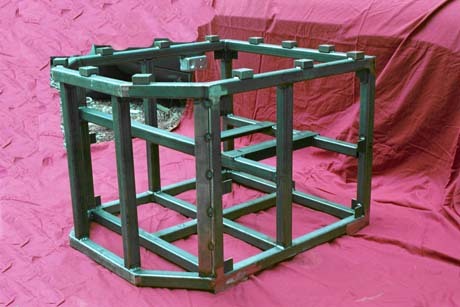 This steel frame is called a complex weldment. Each piece of steel tubing is cut to the correct length. Then the parts are welded together. To reduce the cost of the final assembly; we hold all dimensions to plus or minus .030 inch on every frame. Each frame has 110 individual parts. When assembled each finished complex steel weldment frame weighs 116 pounds. Joe Rivers 1888- 1969(R.I.P.) taught me “gas welding” (oxygen- acetylene) in 1966. (I was 14) Tony Chielo 1928- taught me T.I.G. welding. Tony is one of the very few people whose welded parts are on the moon. I have built many automobile frames. We build replacement frame sections for vintage and antique automobiles. You can see our welding skills on our sheet metal intake manifold page. See our custom stainless steel exhaust system page for examples of our stainless steel fabrication skills. More welding photos can be found on our cylinder head page. Large parts welding photos can be seen on our block welding page. Please call us with any questions you have regarding your production welding fabrication complex weldment needs.